with their habitats ruined the creatures would die. To save all their animal friends. The children are concerned about the impact of humans on the environment and the challenges this poses for animals displaced or threatened by humans and their activities. So they build an ark, and load it with as many endangered Australian animals as they can. They set them off to sea and then spend their time cleaning up and repairing the land. Eventually they deem it safe to bring the animals home again. The text is set to the rhythm of ‘The Ants Go Marching’ and illustrations are presented on coloured pages as if looking through a telescope, with the action spilling beyond the edges of the circle. Images are a combination of painting and collage. Final pages include images from the NLA collections and information about the animals featured. NLA are producing a number of books for children which use images from their collections. 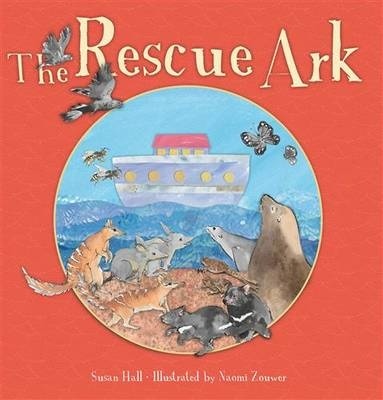 ‘The Rescue Ark’ has a clear conservation theme, and suggests that children can play a role in addressing/redressing environmental impacts on Australian fauna. It also introduces young readers to the Library’s collections. There is ample opportunity for conversation, at home and in the classroom about Australian animals, habitat destruction and pollution, and the ability for each and all to effect their surroundings. Recommended for early- to mid-primary schoolers. 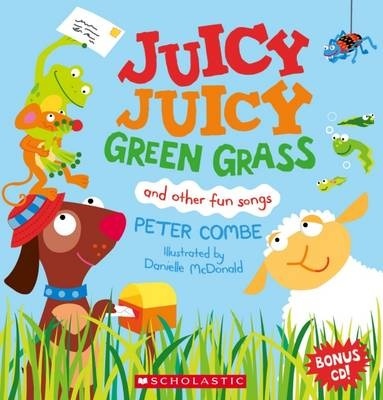 ‘Juicy Juicy Green Grass and other fun songs’ is, as the title suggests, a collection of songs from Peter Combe. The title song laments the lack of green grass and pleads for it to return. ‘The Silly Postman’ suggests that this particular postman isn’t doing his job quite as he ought. ‘The Tadpole’s Song’ tracks a tadpole through his transformation to a frog, complete with his lament for lost youth and ends with a celebration of his new form. The final song, ‘Red Says Stop’ explores and explains the different coloured lights at in traffic lights. Illustrations are brightly coloured and humourous and fill every opening. Juicy Juicy Green Grass comes with a cd of Peter Combe singing his songs. Peter Combe has been delighting youngsters with his lyrical silliness for a generation. His songs encourage singing and dancing and the right amount of ridiculousness. Along the way, children will discover that sheep eat grass for breakfast, lunch and tea; there are some things that do not belong in the letterbox; that tadpoles might miss their tail as well as what to do at the traffic lights to be safe. Childhood is full of learning and it’s great that some of it has been set to song – a reminder that the world needs silliness and fun. Recommended for pre- and early-schoolers. Golly gosh! Oh my! Oh me! The bear might start this story by going over the mountain but the action travels from mountain to the seaside and beyond before it finally returns to the beginning. The bear sees squirrels in the forest. Then a fox sets off to see what he can see and so on all the way around the world, through hills and flat lands, beach and undersea. Illustrations provide clues as to which animal will ‘take the baton’ and take the action into a new spread. Illustrations are full page colour and provide their own narrative separate to the words. 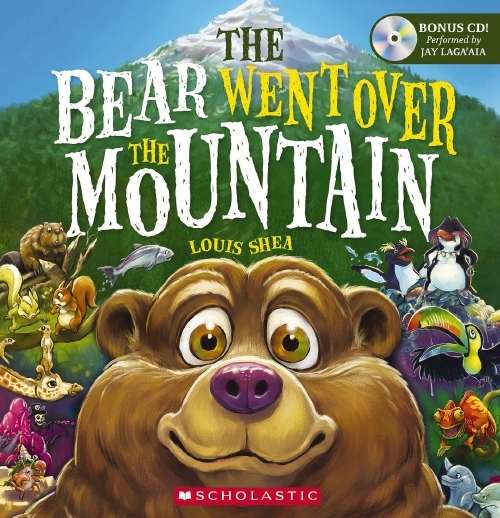 The Bear Went Over the Mountain comes with a CD for singalong. The CD has the more traditional song structure where the book features an abridged version. Young readers will enjoy the cadences of this story and with growing familiarity the song on which it is based. Illustrations are full of detail, and re-readings will reveal new secrets. There are opportunities to open discussions about animals and their differing environments or even to introduce actions to the song. Suited for pre- and early schoolers. For anyone who loves nursery rhymes – and for anyone who has yet to discover their wonders- this delightful offering is just perfect. This cushioned hardcover book offers hundreds of rhymes, brightly illustrated and with touches such as the ribbon bookmark making it a great gift and a collector’s item. From the seemingly universally known rhymes such as Hey diddle diddle, and Mary had a Little Lamb to lesser known ones including Five Bananas, Chubby Little Snow Man and many, many more, there are rhymes to suit every mood or occasion. Compiler Mark Carthew has divided his selections into six categories: Nursery rhymes, Playtime Rhymes, Action rhymes, Counting Rhymes, Finger Rhymes and Lullabies and Gentle Rhymes, and has included a Foreword with a little insight into his selection process. All rhymes are colourfully illustrated by Jobi Murphy using ink outlines and bright fills. Some pages uses bold or bright backgrounds, whilst others are on white. There is plenty of variety to delight young readers. This is a volume to be dipped into and to be treasured by young and old. Simply beautiful. The ABC Book of Lullabies is a collection of lullabies, some familiar, some less so. Some contain extra verses that are less well known. But these lullabies have been gathered to showcase the work of some popular Australia’s children’s illustrators. There are thirteen double spreads and each features a lullaby illustrated by a different illustrator. Styles vary from realistic to fantasy, from watercolour to Photoshop. Many depict night-time scenes, but others, like Tamsin Ainslie’s illustration for ‘Lavender’s Blue’ depict an imaginary garden that is part collage. Lullabies like ‘Lavender’s Blue’ show that it’s sometimes less the words that count than the mood of the singer/singing. Emma Quay’s illustrations for ‘The Man in the Moon’ also grace the cover. Books like The ABC Book of Lullabies are produced for two audiences simultaneously: the child who focuses on the images as the words are read to them and the adult (usually) who is reading. Each will take different things from the reading. An adult may well be interested in the differences between the images and the differing styles of each illustrator. Short bios, including sketches and photos are included in the final pages for those readers. Each illustrator shares a little about what they do and why, and why they’ve chosen the particular lullaby. Children will enjoy this collection whatever time they read or are read to, but it does make a lovely bedtime collection. For adults, The ABC Book of Lullabies is a bit like a sampler, introducing the work of some of Australia’s most talented illustrators. Or perhaps an illustrators’ version of a anthology. Recommended for 3-6 year olds and adults who love illustration. The poems in this delightful collection will have adults and children alike tip-tapping their toesies and clapping and rocking along – though some may want to draw the line at sim-somersaulting as they read – it could be risky. make for fun reading and plenty of giggling. Also giggle-inducing are the illustrations by Pamela Allen, bringing each poem to life with simple yet rich images which capture the movement of the poems perfectly. This is an exuberant offering which parents will love reading to their preschoolers, and older children will enjoy reading by themselves. It is also perfect for classroom use. Rhyming is fun. Kids love the magic of a poem – whether it tells a story, plays with a rhythm or simply explores the fun of words. The Moon in the Man is a magical new collection of poetry from Elizabeth Honey, which kids will adore, and parents and teachers will love reading and sharing. Full of fun and simple rhymes and finger plays, accompanied by bright colourful illustrations, the book will help students to enjoy and improvise with language. Poems include short whimsical rhymes and loads of finger plays complete with diagrams to show the actions. And if these aren’t enough you can see Elizabeth Honey performing these rhymes on the net at www.allenandunwin.com/moonintheman.asp. If that is not enough, there are also longer poems perfect for clapping, clicking or tapping along to, building on children’s love of rhythm, and, to finish the books, a couple of quieter, reflective ones. This is poetry collection which should have a place in every kindergarten, playgroup, child care centre and school, but which is also perfect for sharing at home. Children will love to come back to their favourite rhymes over and over, and will quickly start to memorise the words and read the poems along with you. The poems are also excellent for creative writing sessions, with easily repeatable patterns which children could use to add on extra verses. Elizabeth Honey is a prize-winning author of novels, poetry and picture books, with a style and energy of her own. Her last picture book Not a Nibble! was the Children’s Book Council of Australia Picture Book of the Year in 1997.The Moon in the Man continues her tradition of excellence.